Who does not know palace grounds in Bangalore? For those who are not from here, this is a huge, sprawling ground that holds several exhibitions, of all kinds, hosts music events and people gatherings, sometimes, all simultaneously. From Soul Sante, to defense shows, marriages to education exhibitions, Bangalore’s Palace Grounds sees it all. But not many will know that adjoining Palace grounds, along Fun World, on that little patch of uneven ground between the busy road and the high wall there is a different kind of mundi or market that suddenly and organically sprouts. Since I work in R T Nagar, I pass this area just at the JC Nagar junction every day, and one day in early May there was suddenly a large number of mango sellers, with baskets and truck loads of mangoes on either side of the road, mangoes of every shape, round and elongated, large luscious looking ones and tiny nondescript ones, green and yellow, some with blushes of red. 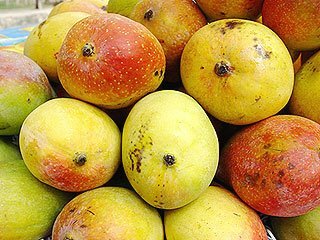 The names of these mangoes can get even more interesting, and range from Raspuri, Bangalura/ Totapuri, Neelam, Benisha, Ladoo, Sakutrikai, Badami and Malguba to name a few. The air is heavy with the wonderful fragrance of ripe mangoes, and people stop by to pick up bagfuls. Sellers cut of tiny slices of mango and let you sample them so you are assured that indeed the mangoes are sweet, not stringy and have the texture you desire. The mangoes are also incredably cheap. 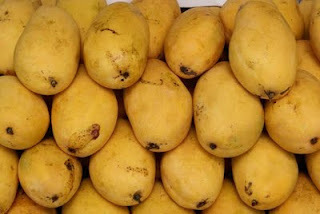 While a fancy supermarket chain could charge you as much as Rs 79 per kilo of mangoes that have been in cold store and probably ripened with chemicals, here you can pick and choose, weaving your way through a host of sellers, tasting along the way, and pick up the best tasting mangoes for a paltry Rs 35 a kilo. For Rs 100 I had a large bag of 3 kilos and not withstanding all that information about the calories gorged myself for a week. The sellers come in from the neighboring villages and even from the neighboring areas of Srinivaspuram in Andhra Pradesh. If you ever go to Srinivaspuram you see a huge board which reads ‘Welcome to Srinivaspuram for the World’s Best Mangoes’, here are orchards and orchards of mangoes and for two months of the year, adults and children get together to first protect the ripening fruit from thieves and monkeys who can destroy large amount of fruit, and then head to cities where they can retail their fruit. For over a month these villages camp, just off the palace grounds, in the blistering sun, with little sanitation or housing facilities. It’s a hard life, and we folks who spend thousands of rupees at fairs and exhibitions on the other side of the high wall, think nothing of how these poor villagers sell some of the most awesome fruit at unbelievable low prices. A week before Bakri Eid the place fills up again. Then, the monsoons in Bangalore are just over, these patches of land are knee high with weeds and suddenly, the Yadavs or goat herders of the surrounding villages of Bangalore descend upon the place. 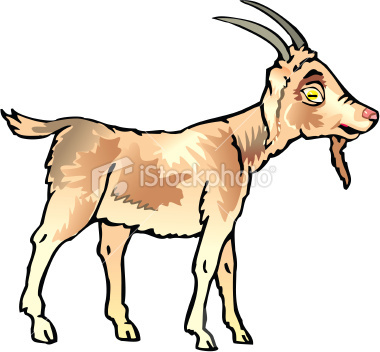 There are goats of all sizes and age, tied in groups to trees or posts dug into the round. The men with course leathery faces and their characteristic thick woolen blankets slung over the shoulders sit on their haunches waiting for buyers. The air is filled with the smell of goat and sheep. It’s an urban shed, about the only time the scent of animals is stronger than that of city life. You see groups of people arguing, haggling, circling the animals, who nonchalantly continue chewing on a few branches, waiting, for the slaughter.